The Pixels were announced today, and there's no other way to put it - they're pretty expensive. The line starts at $649.99 for the smaller, 32GB Pixel and maxes out at $869.99 for the 128GB XL. That's iPhone-esque pricing (the devices literally cost exactly the same as comparable iPhone 7s do). 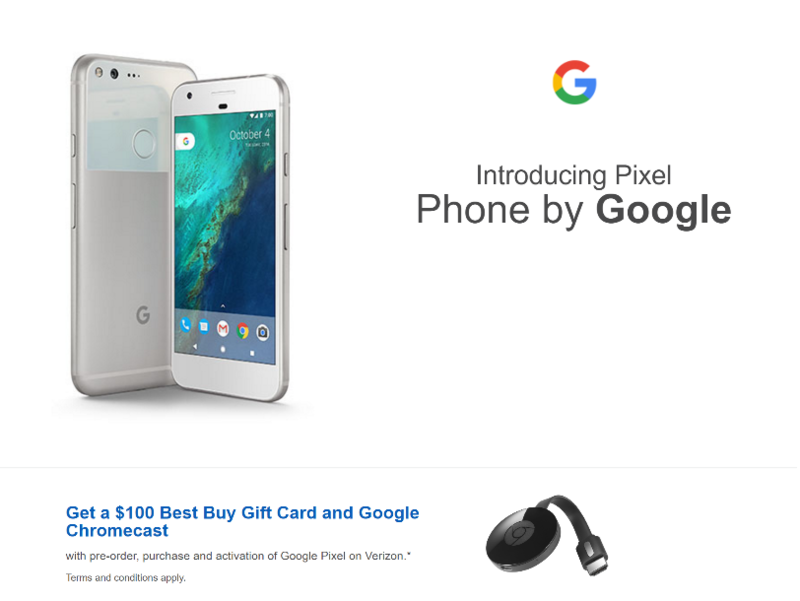 However, if you're a Verizon customer, you have an option to ease the pain; Best Buy is offering customers who pre-order and activate the Pixel and Pixel XL a $100 gift card and a free Chromecast. Considering the fact that these phones launched just a few hours ago, this is a pretty decent offer. Not only can you snag a $100 Best Buy gift card, but you also get a second generation Chromecast (MSRP $35) for free. With that $100, you can buy (probably overpriced) cases, screen protectors, or maybe even some headphones that you'll be able to use, adapter-less, with the 3.5mm headphone jack up top (yes, shots fired). There are a few caveats, though. First of all, the listings for both the Pixel and Pixel XL don't appear to be live yet, so you'll have to keep an eye out for them. Secondly, the Verizon Pixels' bootloaders are not unlockable, so should you want to mod your phone, you may have to wait for a third-party solution (provided one is found at all). And lastly, it seems like Best Buy isn't throwing in the new $79 Daydream View VR headset that Verizon itself and the Google Store are offering with this promotion. Personally, I'd rather have the gift card and Chromecast, but it's your call. The listings are now live; however, it appears that Best Buy is only selling the 32GB models, and the Really Blue option isn't available. In addition, the store has renamed Quite Black to Slate, and Very Silver to Silver.